Brian O'Donovan (aka BOD): How green is my driving? I just got a new car which has a feature whereby it constantly rates the environmental friendliness of how it is being driven. When the car is being driven in a very fuel efficient manner the speedometer display has a green background. 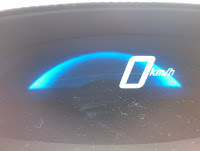 As the driver starts to waste fuel, the speedometer background turns a blueish shade of green and finally when fuel is being needlessly wasted it turns pure blue. Being a gadget freak, I naturally had to experiment with this feature to understand exactly how it works. It seems that the decision about what colour to display is taken based upon what is happening at that exact time, while it would be more useful if it took a slightly longer term view. When I put my foot on the brake and come to a complete stop (e.g. at a traffic light) the engine control system will frequently turn off the engine completely. This behaviour takes a bit of getting used to, because the first few times I though that I had caused the engine to stall. Naturally the efficiency meter is pure green in this case because there is no fuel being used at all. At other times, when I stop the engine is not automatically switched off (presumably because the engine control system detected that the batteries need charging). In this case the efficiency display will turn pure blue. I can understand that it is wasteful of fuel to have the engine running, but since there is nothing the driver can do to change this I am not sure what value this information provides. The most inefficient way to drive is by accelerating quickly away from traffic lights before slamming on the brakes at the next junction. If I drive like this, the meter will show me as green when I slam on the brakes because no fuel is being used as I slow down - however if it averaged the fuel consumption over a longer period it would rightly identify this as inefficient driving.